Today the exciting game showdown of the UAAP Season 75 Semifinal round has finally ended. Four Universities have battled inside the hard court of Smart Araneta Coliseum to win the slot for the championship finale of this event. The first game match today was between UST Growling Tigers and NU Bulldogs, which later on won by UST Growling Tigers with a score of 63-57 (w-l) against their opponent. On the second play match, ADMU Blue Eagles and DLSU Green Archers have a faceoff, a close battle to be exact but still ADMU Blue Eagles aggressive playing gave their win against DLSU Green Archers with a score of 66-63 (w-l). With this, the finale of this seasons event on UAAP will be held still at Smart Araneta Coliseum next Saturday, October 6, 2012. 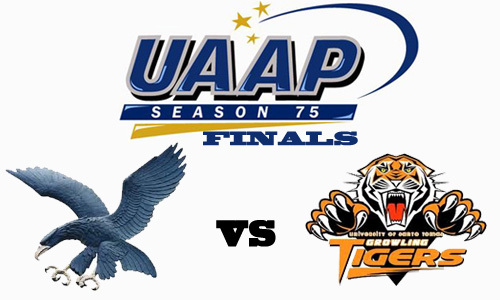 A best-of-three game series will be played by the Universities of UST and ADMU. If any fans of UAAP Mens Basketball event remember, the last time that this two Universities have face each other in the hard court is way back last 2006, where a certain Jervy Cruz has led UST Growling Tigers with a twice-to-beat advantage in winning against ADMU Blue Eagles. For more updates about the UAAP 75 Best-of-three finale just bookmark this page, once an available information is given, I'll write it here as soon as possible. For the meantime, you may share this info to your friends via Facebook, Twitter, Google+ or Pinterest so they may know the latest event on UAAP 75. Comments or suggestions about "UAAP 75 Championship Final Game Schedule and Results" is important to us, you may share it by using the comment box below.